SENS’ NRG is the most accurate, rugged and dependable genset engine start battery charger available. More than reliable, NRG instantly and easily converts to any common lead-acid or nickel cadmium battery – meaning NRG is simple to install and can replace other chargers without pre-planning. NRG automatically adjusts its output to meet constantly changing battery needs. This allows the battery to deliver maximum possible performance and life. SENS exclusive Battery Fault alarm system detects battery problems like high resistance cables and open battery cells. The Battery Fault alarm enables dispatch of service personnel to fix battery problems early – before engine start is needed. 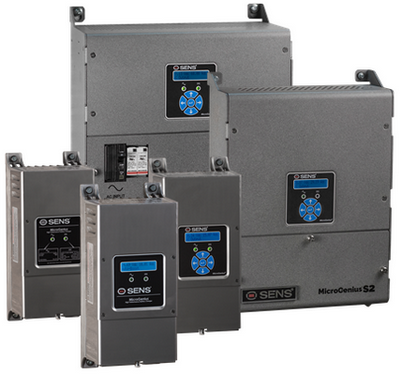 SENS NRG includes EnerGenius® reliability technology. EnerGenius technology delivers high reliability under harsh conditions including electrical and mechanical abuse. NRG has demonstrated MTBF greater than 1 million hours. NRG complies with UL and C-UL standards. 50 Hz models are CE marked. All NRG models are IBC seismically certified to an Sds value of 2.50g and are optionally available with State of California OSHPD certification. Will there be any problems with the NRG if it is operated at a temperature of 70 degrees C? Although 70C is above the NRG’s rated operating range, the charger’s overtemperature protection system will protect the charger by reducing current limit to a safe level. At 70C the NRG can produce about 50% of its rated output current. Although NRG will not suffer catastrophic failure if operated at this extreme temperature, its lifetime will be shortened. All electronic components suffer a reduction in life when operated above their rated temperature. Can two NRG 10A or 20A battery chargers be operated in parallel? Yes, but use of two chargers in parallel will not cut recharge time in half. Customers who use NRGs in parallel generally do so to achieve redundancy. For the most stable operation of two NRG’s in parallel, SENS recommends that one NRG have boost mode enabled (ON), while the other have boost mode disabled (OFF). Although failure to disable boost in one unit is not critical, having boost enabled in both units could potentially lead to odd switches from float to boost mode and back in each unit during a portion of the battery recharge cycle. Such operation would not cause battery damage, but could appear as unpredictable and potentially incorrect behavior to an astute operator watching the LEDs.